If you’re looking for a specialist alternative to standard outward-opening casement windows, then our sliding windows are what you need. Popular in residential and commercial new builds alike, our versatile sliding windows are ideal for projects where projecting or outwards-opening sashes could be hazardous, such as when opening onto corridors or pathways. Aluminium sliding windows have much slimmer frames than sliding doors, but with their double glazed, thermally-broken units they provide just as much soundproofing and insulation as any other window. Endlessly recyclable, aluminium is also attractive for private companies, government agencies and homeowners alike as the green option. Keep reading for more information about the product specifications for aluminium sliding windows or read more about buying from Amberley. Available in 2,3,4 and 6 panel sliding options with multiple tracks allowing all panels to slide and stack to one end if required. 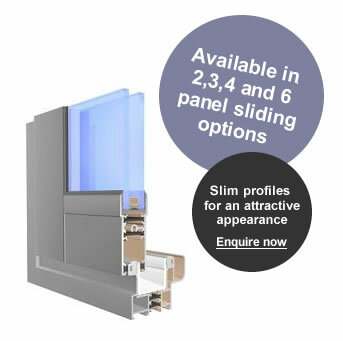 Maximum glass load of 120kg per sliding panel make the Smarts Slide an ideal slimline sliding door system. Our sliding windows are available in any standard RAL, British Standard or silver anodised finish, in single colour or dual colour.